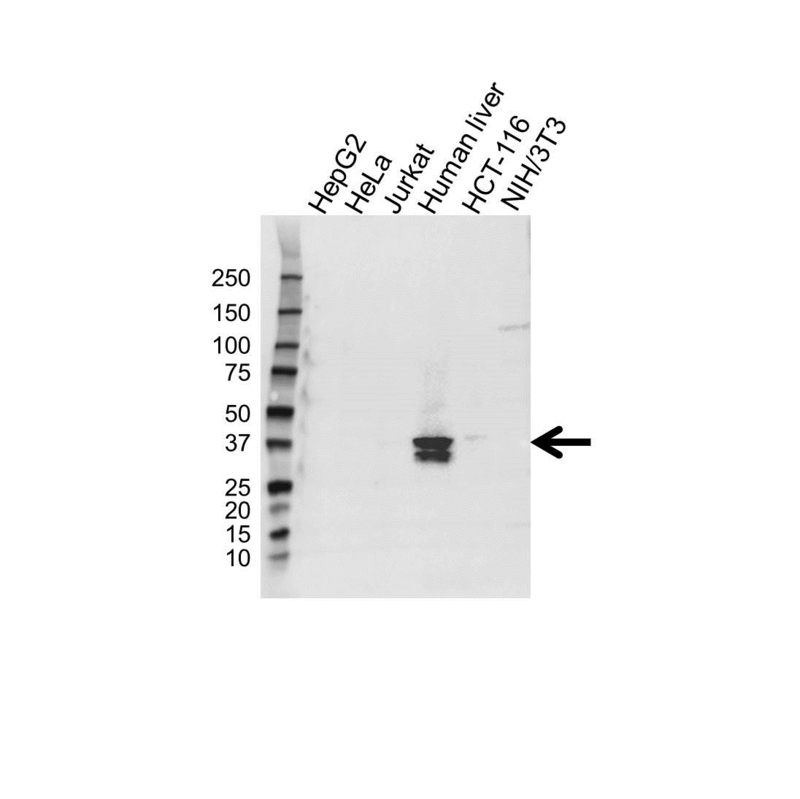 Western blot analysis of whole cell lysates probed with arginase-1 antibody followed by detection with HRP conjugated Goat anti Rabbit IgG antibody (1/10,000, STAR208P) and visualized on the ChemiDoc™ MP with 11 second exposure. Arrow points to arginase-1 (molecular weight 38 kDa). Rabbit anti-human arginase-1 antibody recognizes arginase-1, also known as liver-type arginase or type I arginase. This antibody has been extensively validated for western blotting using whole cell lysates. Rabbit anti Human arginase-1 antibody recognizes arginase-1, also known as liver-type arginase or type I arginase. Arginase catalyzes the hydrolysis of arginine to ornithine and urea. At least two isoforms of mammalian arginase exist (types I and II) which differ in their tissue distribution, subcellular localization, immunologic crossreactivity and physiologic function. The type I isoform encoded by ARG1 gene is a cytosolic enzyme and expressed predominantly in the liver as a component of the urea cycle. Inherited deficiency of this enzyme results in argininemia (ARGIN), an autosomal recessive disorder characterized by hyperammonemia (Carvalho et al. 2012). Two transcript variants encoding different isoforms have been found for ARG1 (provided by RefSeq, Sep 2011). Rabbit anti Human arginase-1 antibody detects a band of 38 kDa. The antibody has been extensively validated for western blotting using tissue and whole cell lysates. Anti arginase-1 detects a band of approximately 38 kDa in human liver tissue lysate.